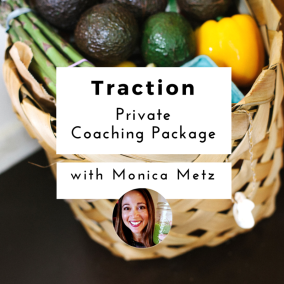 I’m so excited you decided to sign up for Traction, my private coaching package. Before we get started, I’d like you to set aside about 15-20 minutes to fill out the online questionnaire below. This detailed survey will help me determine a baseline for your habits around nutrition, sleep, self-care, playtime, exercise, and other lifestyle markers. I know you’re busy, but I promise this will be time well used — the more detail you share up front, the more productive we can be during our time together. Thanks in advance for filling this out. I’m looking forward to working with you over the next four weeks!